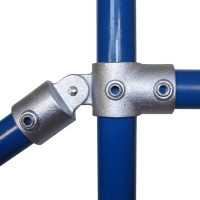 A versatile swivel fitting, often used for braces and where staircase middle rails join level sections. The through tube (vertical in photo) cannot be joined within the fitting. The assembly is riveted together, although items can be supplied separately as 174M and 173F.